On Friday, October 14, a hearing regarding motions for new trials for the four defendants convicted in the Christian-Newsom torture-murder case were held in Knoxville, Tennessee. This is my account of the previous hearing regarding Letalvis Cobbins, the first suspect to be tried. It has links to my article outlining the case and one on the verdict in Cobbins' trial. Judge Sword, who has replaced Judge Richard Baumgatner, was on the bench doing Friday calendar work. It was mostly probationers with drug offenses. Judge Baumgartner who resigned earlier this year, was disbarred on Thursday after pleading guilty to buying prescription drugs (mainly painkillers) from a defendant who appeared in his court. I saw three TV cameras set up in the back of the courtroom. At 9:50 am, I went out in the hallway. 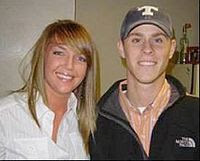 I saw the parents of the victims, Channon Christian and Christopher Newsom. I went over to Chris' father, Hugh, and exchanged greetings. He told me the hearing was scheduled for 10 am. We went into the courtroom. At 10 am, Judge Sword left and Special Judge Jon Kerry Blackwood, who has taken on former Judge Baumgartner's work, took the bench. The courtroom was tense because it was anticipated that the four convicted murderers were about to enter. For a minute, there was dead silence. Two of them, Cobbins and George Thomas, were brought into the courtroom. Both wore Knox County jail stripes. The other two, ringleader Lemaricus Davidson and Vanessa Coleman, did not appear. Attorneys for all four defendants were present. They are seeking the overturn of the convictions in all four trials. This is standard procedure. Judge Baumgartner's troubles have made it very serious. The defense is claiming the judge was impaired during the trials, causing him to make bad decisions. This is ironic. It was obvious that Baumgartner was trying above all to conduct the trials in such a fair way that the verdicts would stand up on appeal. This was the most horrific crime in memory for Tennessee. Who wants to hear the details again? State prosecutors want to call to the stand Capital Case Attorney Susan Jones, who advised Baumgartner during the four trials, at upcoming hearings. They expect her to testify that Baumgartner's judgement was sound. However, Jones, through attorney Tom Scott, claims her dealings with Baumgarner were protected by attorney-client confidentiality. However, prosecutor Leland Price argued the court was the client, not Baumgartner, and this argument should not apply. Davidson's attorney, Doug Trant, then spoke. He told the court they don't need Jones' testimony. He said the files from the Tennessee Bureau of Investigation probe of Baumgartner are enough to get a new trial (Story on Wate.com). "The TBI files itself, the evidence is so overwhelming that there is structural error that the court cannot have confidence in that verdict," Trant said. Channon Christian's father, Gary, spoke at a press conference following the hearing. He feels the defendants got fair trials and the evidence spoke for itself. "Judge Baumgartner, if he did anything, he leaned toward making sure their rights were sought after," Gary Christian said. Even if the defense motions for new trials are denied, Gary says the battle is not over until Eric Boyd is prosecuted in state court. 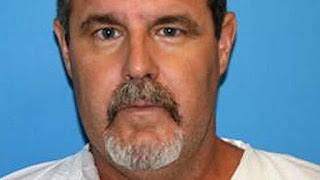 Boyd was convicted in federal court on lesser charges connected to the murders. Judge Blackwood gave the state 15 days to outline the questions prosecutors would have for Susan Jones, reserving final judgement. In still another development, Vanessa Coleman's lawyer's subpoenaed Knoxville News Sentinel reporter Jamie Satterfield to testify at a court hearing. The subpoena was served after the motions hearing. Satterfield is compelled to testify at an evidentiary hearing, which is scheduled December 1-2, 2011. The subpoena does not specify the nature of her testimony. Satterfield has covered the case from the start and has said she plans to write a book on the Christian-Newsom torture murders. Presumably, the December hearing would have testimony from both Jones and Satterfield. My brother is an attorney. He told me the appellate courts will decide on Judge Baumgartner's rulings by their legal merits. If they were sound, the verdicts will stand. For this article, I used the notes I took in the courtroom. I also referenced reports from the Knoxville News Sentinel, and WATE, WBIR, and WATE TV stations. The attorneys were in court this afternoon to give the judge an update. 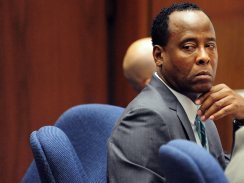 Conrad Murray was excused from appearing. The defense is still getting answers to questions raised when they received a new toxicology report from the State last Friday. The report concludes that Michael Jackson did not have a large amount of lorazepam in his stomach contents, contrary to the defense's own report prepared by a different lab. The State's expert anesthesiologist and pharmacologist, Steven Shafer, will be back on the stand tomorrow morning. He is expected to be on the stand all day. The defense case will begin Friday and will continue through next Wednesday. Among the defense witnesses are four character witnesses, a few police officers, a toxicologist, an anesthesiologist and AEG CEO Randy Phillips. If Dr. Shafer completes his testimony tomorrow, court will be dark Thursday. From Beth's posting, it appears the State is resting their case-in-chief with the testimony of Dr. Shafer. The defense case will only take four days to present. We still don't know at this time if the prosecution will put on rebuttal witnesses, but it's my guess they will. Meanwhile, CNN is reporting that Katherine Jackson is against Prince taking the stand in Dr. Murray's trial, "....and that there are no discussions going on with prosecutors about it." Since I've been concentrating on a personal project, I don't know if this story has hit the national news or not. However, it is all over the news locally in greater Los Angeles since Seal Beach is located just a skip over the county line into Orange County. On Wednesday, October 12th, Scott Evans De Kraai entered Salon Meritage where his ex-wife, Michelle Fournier De Kraai was working and started shooting. This is the worst mass killing in Orange County history. Along with his former wife, five other people died at the scene, and two additional victims were reported dead at the hospital. One victim still remains in critical condition but is expected to survive. De Kraai was apprehended a short time later. From my understanding De Kraai was in a custody battle with his ex-wife over their young son. The latest news coming out of the MSM is that De Kraai suffered PTSD from a tugboat accident in 2007 where one of his legs was severely mangled and a friend died. I personally don't believe De Kraai's PTSD had anything to do with the fact that he went on a shooting rampage in the salon where his wife worked. Custody issues bring out the worst in people, as I've seen over and over again in the cases I've followed. Consider filicide, which is more common than what De Kraai ultimately did. There are parents who make the choice to kill their children, just to hurt the other parent. Orange County District Attorney Tony Rackauckus has filed eight murder charges and will seek the death penalty against De Kraai. Elody's mother, Hattie Stretz, is the lone survivor who watched her daughter die in front of her eyes. Dave Caouette was killed in his car outside the salon. As you are probably aware, I have not been able to continue my coverage of the Conrad Murray Trial. I am quite sorry about this. Although I had hoped to provide a short synopsis of each days testimony, a personal family matter has come up and my sisters have asked that I pitch in with my financial auditing skills. Consequently, I need to devote all my time and energy to that until it's completed. In the mean time, I'd like to provide some links to various places where you can access coverage of the trial. 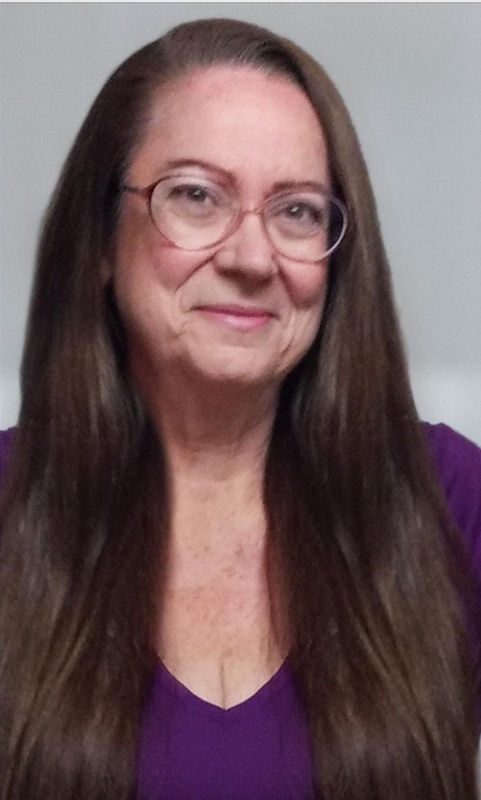 Fellow Crime Blogger Rose Speaks has a daily synopsis and court documents on her site. CNN's IN SESSION has a blog covering the trial. To watch the trial online, there are many sources (just do a Google® search) but my favorite will always be CNN VIDEO. Once the video page loads, click on the link at the top that says LIVE. For edgy reporting, check out THE DAILY BEAST'S coverage. If you're in the Los Angeles area, I highly recommend catching crime reporter Eric Leonard's 4 PM, Pacific Daylight Time reports on KFI, 640AM. Eric gives an excellent recap and always makes the days testimony interesting. If you want to watch the trial at your own convenience, there is an individual "gurgle1624" on YouTube who is uploading (I believe) the complete trial. And if you're into crime forums and want to discuss the case with other individuals I will recommend two forums WEBSLEUTHS and JUSTICE QUEST. They are moderated quite differently but each have something unique to offer. If you're on Facebook, I recommend In Session's page as well as Beth Karas' In Session page. Although I have not followed the trial since Day 5, I do try to hear Leonard's report on KFI when I can. If you have questions, or would like to discuss the case here, please feel free to leave a comment. Please remember that comments are moderated. All we ask is that you be respectful. Today the Inglewood Police Association announced their endorsement of Alan Jackson to become the next District Attorney of LA County. This is yet another testament to Jackson’s strength and staunch support from the rank and file law enforcement community. 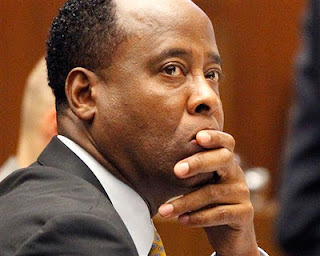 As District Attorney Jackson intends to build upon his rock solid reputation as a cop’s prosecutor to protect our families and children across the county. “We’re certain that your knowledge of the law, leadership skills, strong work ethic and the experience you have gained as a Deputy District Attorney will serve you well and be a tremendous benefit to everyone who resides or works in the County of Los Angeles. 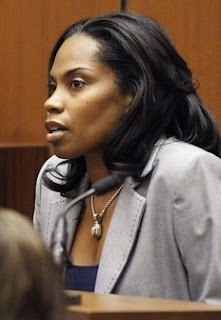 We also feel that you are a role model and set a fine example that other attorneys should follow,” stated Detective Loyd Waters, President of Inglewood PA.
Deputy DA Alan Jackson has earned strong support from other public officials such as County Supervisor Michael Antonovich, State Senator Tony Strickland, Los Angeles City Councilmember Dennis Zine, Long Beach City Attorney Robert Shannon, former La Cañada-Flintridge Mayor and current City Councilmember Steve Del Guercio, San Gabriel City Councilman Mario De La Torre, Honorary Mayor of San Pedro Anthony Misetich, and El Monte Chiefs of Police Bill Ankeny, Tom Armstrong, Wayne Clayton and Ken Weldon. Dr. Conrad Murray and his defense team. I incorrectly reported that Sade Anding testified yesterday. She is testifying Tuesday morning. Sprocket. A recap of the witnesses today. Monday's testimony continued with #11 Richelle Cooper returning to the stand. She testified much the same as she did in the preliminary hearing. In Session's Beth Karas reported on her Facebook page that defense attorney Michael Flanagan cross examined Dr. Cooper about her use of propofol in her medical practice as well as her knowledge of how long benzodiazepine and Lorazepam stay in the body. AT&T Employee #12, Edward Dixon testified about Dr. Murray's AT&T phone, data and text message records. Dr. Murray was talking and texting all morning while treating Jackson. Witness # 13, Jeff Strohm, Sprint/Nextel employee testified about more phone records much the same as his preliminary hearing testimony. DDA Deborah Brazil performed the direct of the phone records and Nareg Gourjian performed the cross examination. 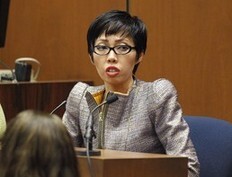 Witness # 14, Dr. Thao Nguyen, UCLA emergency room doctor is on the stand detailing her CV. She's smart as a whip. I believe DDA David Walgren presented the witness. She was on the CCU rotation at UCLA when Jackson entered the ER. Dr. Nguyen testified pretty much the same as her preliminary hearing testimony. She was the fourth witness the prosecution called that testified Dr. Murray did not mention propofol to her as a drug that he had given Jackson. Defense attorney Flanagan tried to shake her testimony but she had a response for him every time. Dr. Murray could not tell Nguyen a timeline of when he gave Jackson two doses of Ativan (aka lorazepam), when he arrested and how long before paramedics arrived. Murray told Nguyen, "I have no concept of time." Witness #15, Dr. Joanne Bednarz-Prashad did not testify in the preliminary hearing. She called Dr. Murray the morning of June 25th to ask about a patient of his about to undergo surgery in a Houston hospital. Dr. Bednarz-Prashad was surprised that Dr. Murray had the information she needed immediately, and did not have to go check a patient file. Witness #16, former Dr. Murray patient and friend, Antoinette Gill. Spoke to Dr. Murray on the morning of June 25th, 2009 and everything was normal. Witness #17 Consuelo Ng, met the defendant through her grandmother in 2003 or 2004. He was treating her grandmother. After saving grandma's life, she began to work in Dr. Murray's office as a volunteer. Prior to that, she worked in a group home as a caregiver. In June, 2009, she volunteered in his office five days a week from 2004 to 2009. She is not a nurse. CN: I would help in filing, answered phones, help in the front and the back room. I would take vitals and pulse rate. Ng worked at Murray's Los Vegas office, on Flamingo Rd. She describes the layout of the office and the number of treatment rooms. She also testified about treating patients with specific cardiac equipment. #18 Bridgette Morgan, one of three girlfriends to testify for the prosecution. Morgan called Dr. Murray on the morning of June 25th but did not speak to him. Prosecutors were prevented from asking questions about where she met Dr. Murray, (a Los Vegas nightclub) the nature of their relationship and that he gave her his number on a cocktail napkin. Witness #19 Sade Anding, one of three girlfriends to testify for the prosecution. Anding was on the phone with Murray when she heard something strange. Here is an interview with Anding back in February, 2011. HERE is a link the the California Evidence Code. If you hear Judge Pastor make a ruling and cite a number (for example, 352), you can look up that number to have a better understanding of Judge Pastor's ruling. FOX NEWS has a who's who list (judge, all counsel, etc.) and a bit of history on the major players in the well of the court. Go to the link and scroll down to the bottom of the page to see the list. On November 1st, 2007 in Perugia, Italy, English student Meredith Kercher was sexually assaulted and brutally murdered in her bedroom flat. Her roommate, American Amanda Knox and Knox's boyfriend, Raffaele Sollecito were convicted of Meredith's murder on December 9th, 2009. A third individual, Rudy Guede was also convicted in a separate trial. The Italian court system is quite different that the US. An appeal is heard by a judge and jury, and the judge is inside the jury room during deliberations. Today, an appeals court overturned Knox's and Sollecito's convictions for murder. She was convicted of another charge, defamation, from initially identifying her employer, Patrick Lumumba as being in the apartment with Meredith. This is a case that has sparked strong opinions as to the guilt or innocence of these two young people. Personally, I have leaned more towards the opinions of lie detection expert, Eyes For Lies, and what she has written about the truthfulness of Amanda Knox's public statements. For those of you who are not familiar with Eyes For Lies, HERE is an explanation about her abilities. HERE is the link to read Eyes For Lies analysis of the Amanda Knox case.